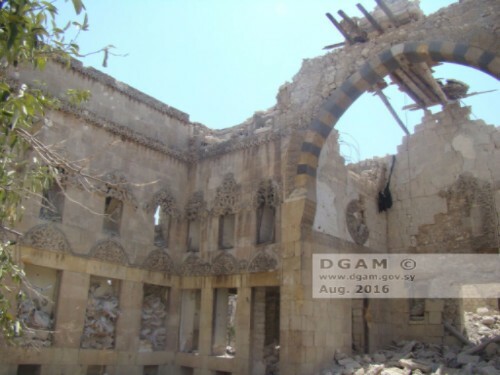 On August 20 the DGAM provides an update on damage to Beit Ghazaleh and Beit Ashiqbash in Aleppo. Historic 18th century buildings have been severely damaged. See photographs here. On August 17 the DGAM provides an update on damage to a number of sites in the countryside around Idlib, several of which are part of the World Heritage site, Ancient Villages of Northern Syria. See details and photos here. Construction of a multi-lane road and irrigation trench through a section of the ancient site of Nineveh in ISIL-occupied Mosul was completed in June 2016 (ASOR CHI Incident Report IHI 15-0097 UPDATE). New looting tunnels have been identified at the site of Nineveh using DigitalGlobe satellite imagery (ASOR CHI Incident Report IHI 16-0010 UPDATE). Iraqi Government airstrikes reportedly damaged several mosques in Fallujah, al-Anbar Governorate between 2014 and 2016, before the start of the campaign to retake the city from ISIL militants in May 2016 (ASOR CHI Incident Report IHI 16-0024). Iraqi Government airstrikes allegedly destroyed al-Habib Muhammad Mosque in Hit District, al-Anbar Governorate (ASOR CHI Incident Report IHI 16-0025). Local activist groups published new photographs of damage to al-Fatah Mosque in Manbij, Aleppo (ASOR CHI Incident Report SHI 16-0104 UPDATE). Local activist published new videos of damage to a cemetery and mosque in Kafr Hamra, Aleppo Governorate (ASOR CHI Incident Report SHI 16-0108 UPDATE). An ARA News article provided more details of the July 17-18, 2016 attack on Mar Sharbel Syrian Orthodox Church in the village of al-Witwitiyah, al-Hasakah Governorate (ASOR CHI Incident Report SHI 16-0108 UPDATE). A Russian airstrike allegedly damaged Musaib bin Umeer Mosque in al-Tabqa, Raqqa Governorate (ASOR CHI Incident Report SHI 16-0111). SARG and Russian airstrikes allegedly damaged seven mosques in the city of Idlib on July 22, 2016 (ASOR CHI Incident Report SHI 16-0112). A SARG helicopter allegedly dropped a barrel bomb on a mosque and rocket-propelled grenades damaged a second mosque in the city of Aleppo (ASOR CHI Incident Report SHI 16-0113). The DGAM reported severe damage to the entrance of the Aleppo Museum in the city of Aleppo (ASOR CHI Incident Report SHI 16-0114). A SARG airstrike allegedly damaged Aqil ibn Abi Talib Mosque in the suburbs of Damascus (ASOR CHI Incident Report SHI 16-0115). Mortar fire allegedly originating from opposition territory struck and damaged a restaurant located in an historic building in the Old City of Damascus (ASOR CHI Incident Report SHI 16-0116). Two ISIL suicide bombings damaged Qasemo Mosque in al-Qamishli, al-Hasakah Governorate (ASOR CHI Incident Report SHI 16-0117). A SARG airstrike allegedly damaged al-Sheikh Khalil Mosque in the city of Daraa (ASOR CHI Incident Report SHI 16-0118). 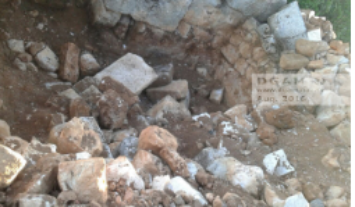 SARG airstrikes reportedly hit the Byzantine site of Shinsharah in Idlib Governorate, causing unknown damage (ASOR CHI Incident Report SHI 16-0119). Looting helps fund European militants, reports the WSJ on August 25, especially from materials trafficked through Belgium. See the article here. The Director-General of the DGAM, Maamoun Abdulkarim, suggests that over two-thirds of intercepted artefacts in Syria and Lebanon are forgeries. Read the article in The Art Newspaper here. The DGAM reports on the participation of Dr. Maamoun Abdulkarim in the Edinburgh Cultural Summit (24-26 August 2016) on their website here. More information on the summit is below. The Fulbright Scholar-in-Residence program for 2017/18 “offers additional grant opportunities for all U.S. colleges and universities to apply to host scholars or professionals in Cultural Heritage Protection and Preservation from Morocco, Tunisia, Algeria, Libya or Iraq.” For more information, see here. Apply here. The Edinburgh Cultural Summit wrapped up on August 26, and was attended by the Director-General of the DGAM, Maamoun Abdulkarim. See the report on the summit from the Edinburgh Reporter here. Edinburgh World Heritage has offered to help the DGAM with restoration of damaged sites in Syria. See here and here for details. Online Learning Series on Humanitarian Law and Policy – Protection of Cultural Heritage in Armed Conflicts. The Huffington Post reports on the ramifications of the ICC case against the Islamist Ahmad al-Faqi al-Madi on August 22 here. See also coverage in the Korea Times here, and the Telegram here. Mohammed Adam writes a pieces praising the decision here for the Ottowa Citizen. BBC audio podcast: Newshour extra – What is the Cost of Preserving the Past? Saturday 27 August. Available here. Interesting discussion (about half way down, after more coverage of the ICC trial) on steps taken in the past to protect heritage, and their relative successes, on why they are destroyed, and on military necessity in al-Jazeera here. The Sydney Morning Herald looks at ‘Protecting antiquities in Syria and Libya from Islamic State‘, and interviews Maamoun Abdulkarim, here. Sapiens discusses ‘the Problem with Heritage‘ and why it’s important to protect it, here. Charged Affairs discusses the need for Monuments Men in Iraq and Syria, in the original sense of a military unit, here.